Tesla boss Elon Musk is considering taking the electric-car firm private, a move he claimed was the “best path forward” for the company. Mr Musk said de-listing from the stock exchange meant Tesla would no longer be pressured into making short-term decisions to appease investors. In an unusual move, Mr Musk first made the announcement on Twitter rather than via an official regulatory disclosure. 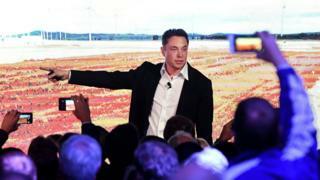 Mr Musk said investors backed the plan which requires a shareholder vote. He said shareholders would be offered $420 per share – around a fifth higher than the current price. Mr Musk claimed to have secured funding to buy out shareholders, but did not offer any further detail. However, he also warned that “a final decision has not been made” about the move. Tesla shares ended the day 11% higher at almost $380 per share – close to their all-time high. Trading in the shares was initially suspended after Mr Musk’s tweets – pending a more formal announcement. While Twitter was an unconventional way to make the announcement, the US market regulator, the Securities and Exchange Commission, allows firms to use social media outlets like Facebook and Twitter in this way provided investors have been told which social media outlets will be used. However, it was unclear whether Mr Musk had done this. Both the SEC and Nasdaq failed to respond to requests for comment. Mr Musk has discussed the drawbacks of being a public company before. But his tweets stirred confusion initially, given his history of informal use of the social media service. For example, on April Fool’s Day, he joked on Twitter about Tesla going bankrupt. The firm subsequently shared a message from Mr Musk to employees that explained the thinking behind his announcement. Mr Musk, who owns almost 20% of the company, said he hoped the move would shield the firm from distracting swings in the share price and the pressure to meet quarterly financial targets. He also said he wanted to end “negative propaganda” from short sellers, investors who bet on the shares of a firm going down. “Basically, I’m trying to accomplish an outcome where Tesla can operate at its best, free from as much distraction and short-term thinking as possible,” he wrote. If Tesla were taken private at $420 per share, it would be one of the largest such transactions in history – a deal worth more than $80bn, including the firm’s debt. Mr Musk’s plan would allow investors to choose to retain their holdings. He planned to hold onto his shares and hoped to continue as chief executive, he added. Gene Munster, an analyst at Loup Ventures, said Mr Musk had a “one-in-three chance” of managing to succeed with his plan. “The 16% premium to the current share price may not be high enough to incentivise existing shareholders to support the sale,” he added. Elon Musk has had a difficult relationship with stock market investors – and been particularly angered by so-called short sellers, who have made record bets on the ultimate collapse of Tesla. On Tuesday, those same short sellers were threatened with big losses after he tweeted that he was considering taking the electric car maker off the market and back into private ownership. The messages sent the share price surging before trading was halted. But it bears noting that Mr Musk is known both for his erratic outbursts and for his quirky sense of humour. Both have been frequently on display as Tesla has struggled to hit production targets. That’s briefly left some wondering if this is all just another way of turning attention away from the fact that Tesla has yet to turn a profit. Mr Musk’s disclosure stirred further speculation about Tesla’s future. The firm is spending heavily as it ramps up production of its latest car, the Model 3. It reported a record loss in its most recent quarter, and some analysts say it will need to raise money in order to survive. However, Mr Musk has said he has no plans to do so and promised that the firm will be profitable in the second half of the year, barring any unforeseen events. The tweets came after a separate report in the Financial Times that Saudi Arabia’s sovereign wealth fund had taken a 3%-5% stake in Tesla, a holding worth at least $1.9bn. The article said the state fund, overseen by the powerful crown prince Mohammed bin Salman, had been interested in buying newly issued shares.